March has been declared by The Philippines Congress as Women’s Month. This is toprovide wide-latitude for women all over the country to implement awareness, advocacy and action activities in their communities and thus uplift the status of women. The Negros Museum celebrates the achievements of the Women’s Movement in the past years, now and in the future in partnership with women’s organizations. 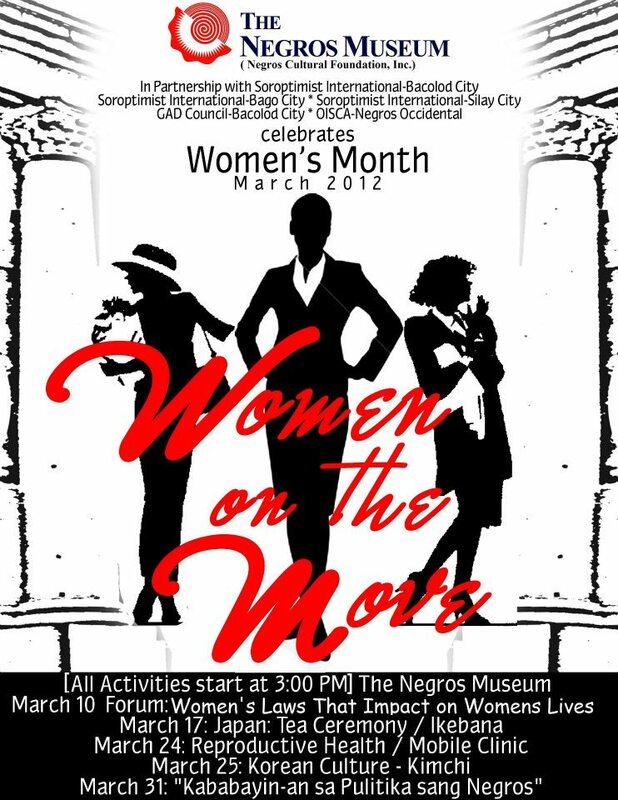 Please see photo enumerating various activities lined –up for the Women’s Month Celebration. For any inquiries, please get in touch with Niña or Israel at telephone numbers 708-5080 or 4334764 (all staff of Negros Museum). The Museum is open from Tuesday to Sunday 10:00 a.m. up to 7:00 p.m. Best Wishes.